New features have been added to the web-based writing resource Writing A-Z. With new student facing interactive writing tools and a redesigned site, teachers now have an even more comprehensive writing product that delivers everything they need to improve the writing skills of their students. 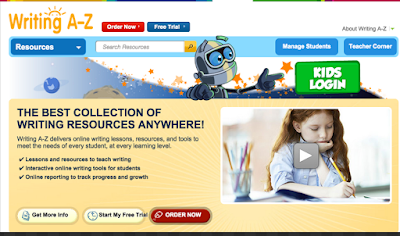 The collection of interactive online writing tools allow students to apply their writing skills and creativity while creating their own books, writing essays, and completing specific process writing tasks. Students submit books and compositions to their teacher for posting to a classroom bookshelf or writing wall for classmates to read and respond to. Additional new features include the ability for teachers to schedule and score writing assignments online, and to track individual and class-wide progress with digital reporting tools. Teachers have access to hundreds of leveled lessons, worksheets, and supporting resources designed for students at various developmental levels, from emerging writers just beginning to experiment with words and sounds, to writers ready to master the five steps of the writing process.